Sunday breakfasts should be meticulous and well planned. They should be slightly fancy and fully satisfying. While I am obsessed with smoothies and oatmeal and cinnamon raisin toast smeared with almond butter- these options, in my opinion, are for weekdays. Sunday breakfasts go great with fresh drip coffee and your most comfortable sweats. And your favorite DVR’d television shows from the week that you need to catch up on. 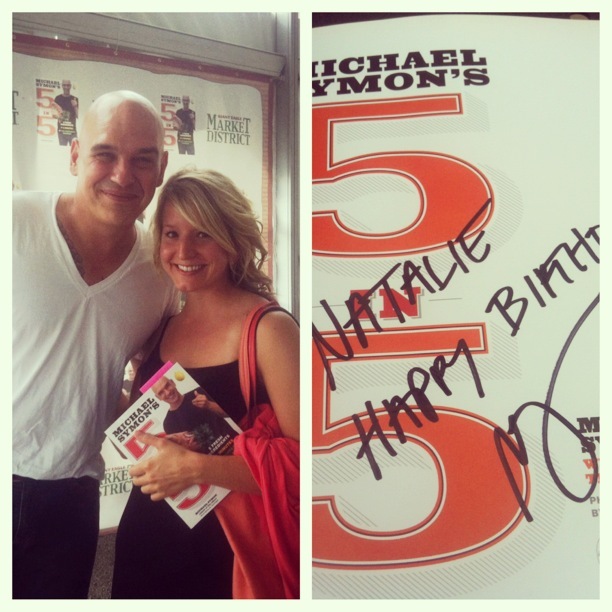 I was watching The Chew [yes, I DVR daytime television] and watched one of my favorites, Michael Symon, create a totally inventive dish using eggs and avocados from his new cookbook: 5 in 5. Let me just boast for a minute that I have a copy of this cookbook from the man himself. End boast. With a few staples from your kitchen- you can create this healthy and indulgent breakfast that will impress your family and make your tummy happy. Egg-ocados– the new breakfast of champions. 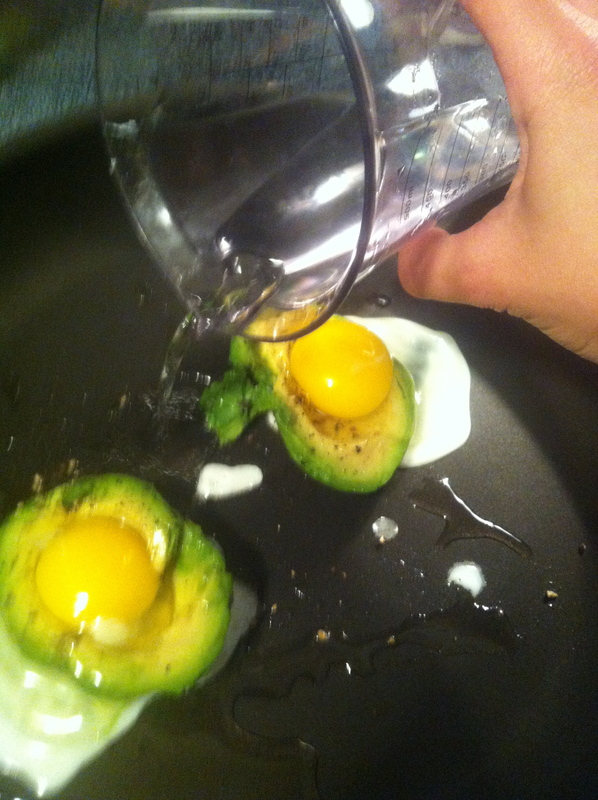 Cut the avocado in half and remove the pit. Carefully scoop the flesh out its skin. Lay out a piece of plastic wrap on a flat surface and place the avocado on top. 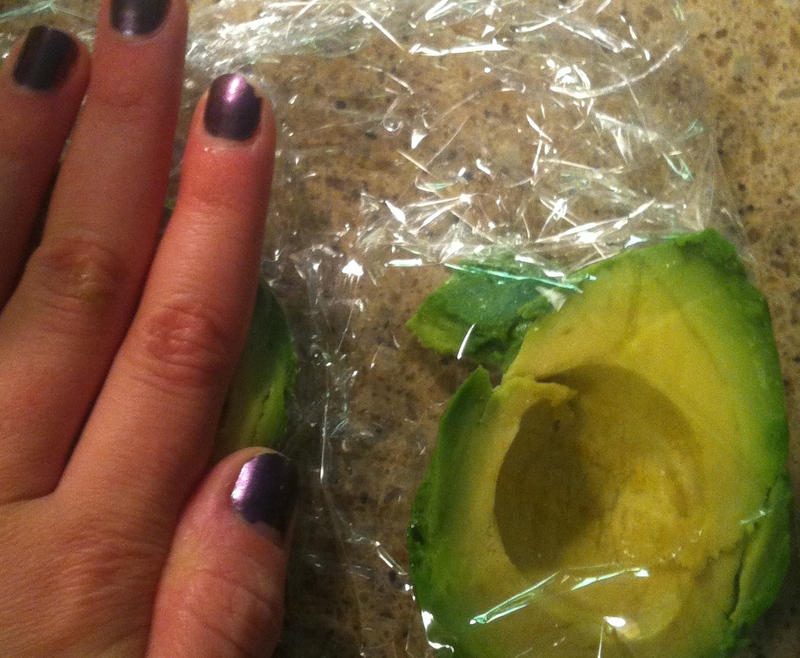 Fold up the plastic over top of the avocados. Gently press the avocado halves down inside the plastic so that they flatten out just a bit. Don’t crush it completely- just gently apply some pressure. It’s okay if they crack a little bit! Heat some olive oil in a frying pan over medium heat. 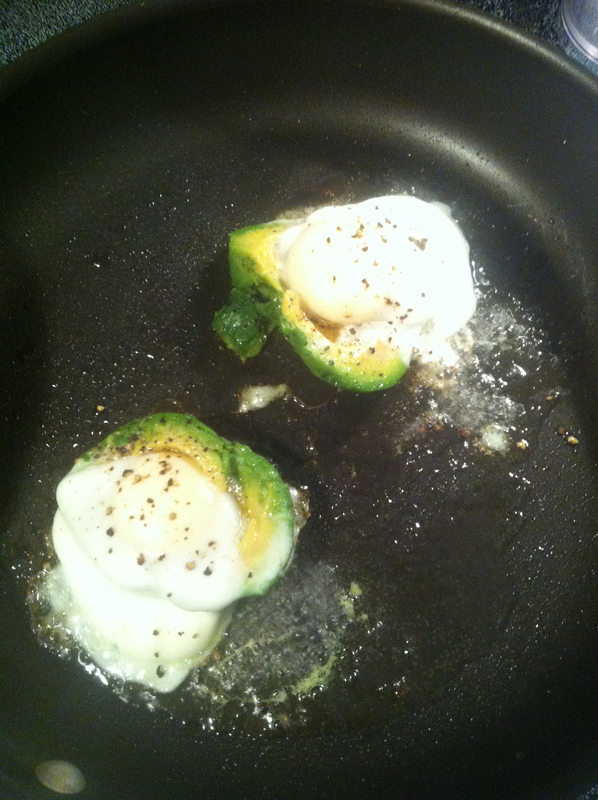 When the oil is hot- it is time for the avocados to go into the pan! 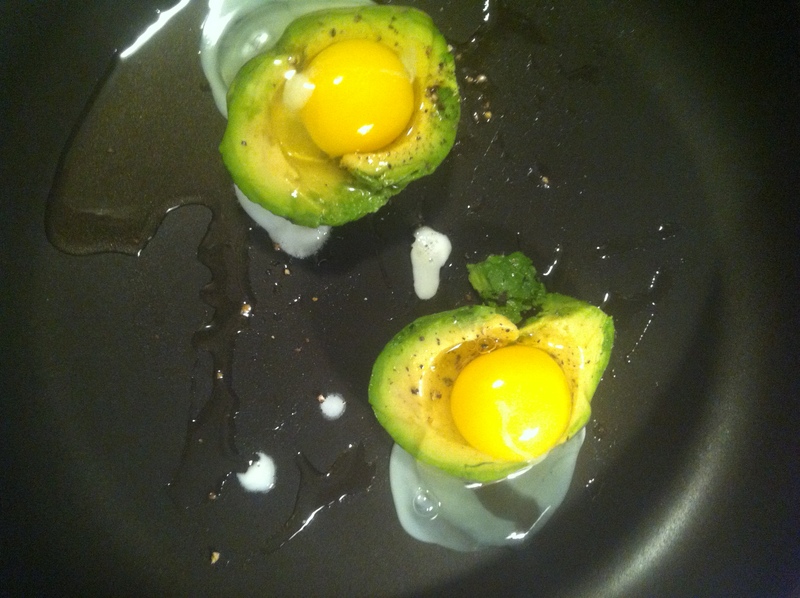 Crack the eggs gently into the center of avocado so that the yolk falls into the “pocket”. 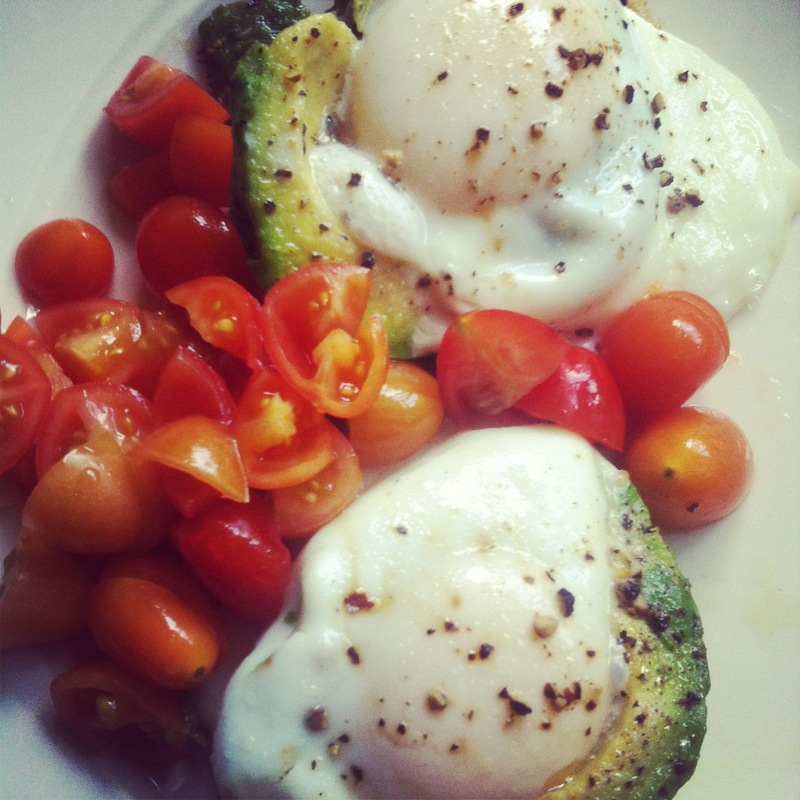 So- how will the egg cook if its in the avocado? Turn the heat up from medium to high and then pour about 1-2 tablespoons of water into the pan [not directly onto the eggs] and cover with a lid so the eggs are able to steam. Allow the eggs to cook for a few minutes until they reach your desired doneness. Finish your meal with some freshly sliced cherry tomatoes and crunchy toast for dipping! ← Organic- to buy or not to buy? Looks GREAT!! What Sunday can I plan on for you to make this for ME?